In 2000 Genesis Park staff trekked through the swamps of southern Cameroon, conducting interviews with indigenous pygmy communities. The Baka pygmies identified pictures of a Triceratops with an animal they call the Ngoubou. They reported it being big as an ox, possessing a neck frill, and sporting from one to four horns. Apparently the mature male has the largest frill. Perhaps this is the same species as the Emela-ntouka in the Congo and the observers there merely saw the single-horned variety or younger creatures. 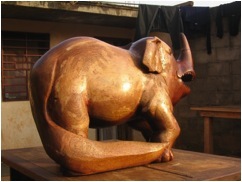 The Ngoubou is said to inhabit the savannas along the Boumba and Sanga rivers where it is known to fight with elephants. French cryptozoologist Michel Ballot’s 2004 photograph (left) of a native’s wood carving representation of Ngoubou bears some resemblance to the picture of the Emela-ntouka from Roy Mackal’s 1987 book A Living Dinosaur.